Home » blogging , humour , personal , UBC-Summer-Drive » Why Do I Write? Day 3 of "2013 Ultimate Blog Challenge" : Why Do I Write? I have always been a "writing person" - be it long letters to friends, or just random articles written before a particularly difficult exam, to take my mind off the exam pressure. Even before anybody knew about blogging, I had my own "personal blog" of sorts, hosted on free geocities, and built in HTML, where I loved to write. So why do I write then? Sometimes I write to connect with people, share stuff from my life with them. Sometimes, I just want to share my views and opinions. At times, I may want to share a good read that inspired me or touched me in some way. Then there are those occasional spells when I feel this incurable urge to inspire and motivate people... like the very first round of daily-blogging I did here (September 2010 - Live Life series). These spells have become more and more infrequent in the recent times though. Maybe I've become more detached. Anyway, coming back to the topic in hand, mostly I write just to express myself. It is so difficult these days to have a proper conversation with people, where they actually listen to you and let you complete whatever you are saying. Jet age? I guess so. Everybody does seem to be in a rush. They always seem to believe they already know what you're going to say next. So they don't even let you finish. Like I said, very difficult to talk to most people. Hence, this space. I can rant here. I can laugh here. I can feel sad here. In short, I can freely give vent to whatever emotions I may be experiencing, and all you lovely readers patiently 'hear' me out (ok, 'read' me out!) and, occasionally, even stop by to offer a few kind words. That's not all though. There are a few other reasons too that make me write/blog. Sometimes, I have to record stuff for my own later use. For example, these recipes. I try various permutations and combinations from the net, and finally narrow down to that one perfect recipe that works for me. But by the time I make that dish the next time, I've usually forgotten my past experiences with it! Therefore, I find it best to record it someplace where I'll be able to find it easily. At times, though very rarely, I also try to share stuff that I've learnt, mostly in the blogging section here. Writing good quality knowledge base articles takes some time though. Especially if you're prone to be a perfectionist like me. (Posts must be well-formatted, perfectly spaced and aligned, with supplementary images, and a whole lot of other nonsense!) So I don't do this type of writing as often as I'd theoretically like to. At times I write to explore my creativity. As of now, even this happens very rarely. I have attempted very few styles of writing outside my 'comfort zone'. For example, fiction and poetry are still majorly unexplored areas for me so far. And I've never even attempted any form of macro writing... 55-F, 77-F, Haiku. For me, writing a 250-word long post is macro enough! :P But yes, there have been rare moments when I have managed to write something unusual and creative. Till now, they have happened on their own... i.e. spontaneously... without me actually putting an effort into it. Perhaps one day I'll start making a conscious effort to attempt new things in writing. P.S. - If you ask my Dad or sister about why I write, their response would be quite different. They'll just say - "Oh we got fed up of listening to her go on and on and on... so she had to find some other poor souls to torture. Better you than us!" This is my third post for 2013 Ultimate Blog Challenge. Link to the previous post: "Saying 'No'"
I think I agree with all the points here. Even I sometimes write if I want to rant about something which I am sure nobody in real life has time to listen to :D We indeed are living in a jet age. People have no time to listen or talk. You and I have a lot in common in the whys we write. We are kindred spirits and I am thrilled to have found you. all your reasons make perfect sense! lol @ the reasons that wud come from your father & sister!!! Blogging as a medium, helps us connect to people and also to our innermost thoughts! @Gayu - Hahhh! The family members of all bloggers are alike! :D They truly believe that we are insane, and that blogosphere is an asylum for holding all such insane people! As for technology, I enjoy watching passersby on streets and people out for lunch/dinner etc., and I find it most amusing to see everybody glued to their smart phones, totally oblivious to the people and surroundings around them! Hi, writing is very therapeutic. It also helps one to put together thoughts and express them in a logical and coherent manner. Lately, I had also started feeling a strong urge to connect with people outside my workplace and to write and read about issues outside my immediate professional interests. I am so glad that UBC has introduced me to this and other interesting blogs that I would have never discovered otherwise. By the way, Chicky, you have a link on the top of your blog page to like you on Facebook, which I can't because I am not on Facebook. How do I follow you on blogger? Hi Kaneenika! Yes, I only recently discovered this system of blogging challenges. Previously, I used to do daily blogging (NaBloPoMo) rounds completely solo here. But I agree... it is so much more fun doing it as a part of a community, connecting with so many other bloggers. If you wish to follow my blog via blogger, just click on the button "Join this Site" in the Subscription Options section below the post (That orange box). Hi Miss Teerious - I enjoyed your post. I too had websites where I wrote over at Geocities and Women.com before I discovered blogs and blogging. Then I couldn't be stopped. I also was quite the letter writing in my teen years. It's a lost art. I keep telling myself I am going to get myself a pen pal, and now that I am taking a year off from everything I just might do it. In addition to everything you have mentioned above, one by-product of writing regularly is that I find myself being more observant of things around me and the mindful of what I am experiencing. It is a wonderful way to fuel the thoughts! @ farfromdone - Apologies for the delayed response. Don't know how I missed replying to some of those comments from early last month. Having a pen pal should be a fun thing to do. I once had an email-pal... many many years ago. Early 2001, I think. We exchanged very few mails though. Letter writing is definitely a lost art now. 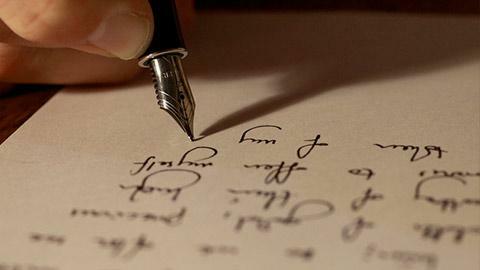 For me, personally, I would say even writing is on the verge of becoming a lost art!